When you are considering your treatment options, it’s important to understand how a procedure will best serve your needs. Using cutting-edge technology and our expertise, we create a personalized treatment plan for you. Learn more about the benefits of dental implants and what sets us our office apart from others in the Annapolis area. What Can Dental Implants Provide You? 98% success rate – highest of any dental procedure! Avoid bone loss and gum recession associated with tooth loss. Restore proper chewing, leading to a better diet and improved health. Avoids grinding down healthy teeth for conventional bridgework. Choosing a local dental implant expert in Annapolis who has the verified training, education, and experience specific to dental implants and sedation dentistry is crucial: dental implants are a big investment in your health and finances. When you choose Djawdan Center for Implant and Restorative Dentistry, you get expert healthcare using cutting-edge technology in a comfortable, non-judgemental environment, and with flexible payment options. Dr. Djawdan is a member of a small group of dentists who are Board Certified by the American Board of Implantology/Implant Dentistry and is considered and expert in implant dentistry. Dr. Kian Djawdan has the experience, training, and credentials to personally handle both your surgical and restorative dental goals. We use advanced technology to offer our patients precision and accuracy in diagnosis and treatment. 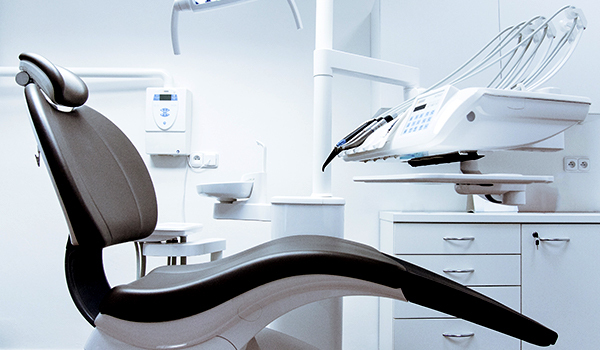 In 2004, we were one of the first dental practices in the world to have an in-office dental CT scan. 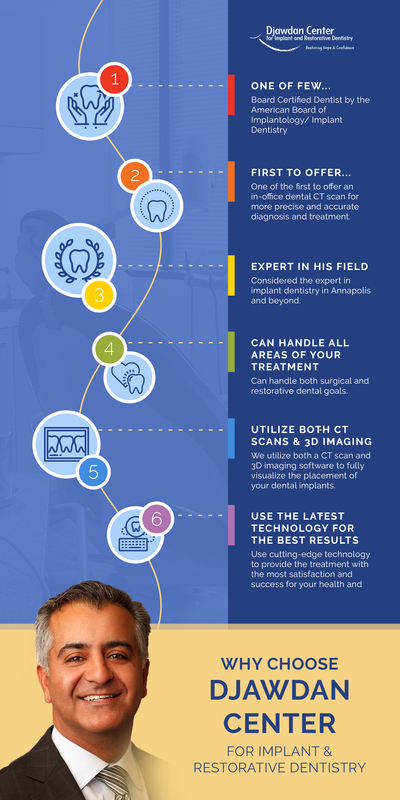 With a dental CT scan and 3D imaging software, we can fully visualize the placement of your dental implants in a real 3D environment and then design a surgical and restorative plan. Computer-guided dental implant surgery streamlines the treatment process and provides the patient with permanent teeth in record time. The system combines a unique planning program, a surgical template and the immediate load concept.CT Scans and 3D imaging software are used to assess bone structures and map out the areas of best integrity. Computer-guided dental implant surgery provides greater patient satisfaction and simplifies the dental implant treatment process.You will feel comfortable knowing that Dr. Djawdan in Annapolis will personally handle every step of your tooth replacement, including planning, surgical placement, and restoration. We offer the convenience of one office with one dentist. Losing one or more of your teeth creates a gap in your smile, affects your ability to chew properly, and can alter your diet and nutrition. In addition, tooth loss can lead to bone loss – which can alter the shape of your face and make you appear much older than you actually are.These images simulate the progression of bone loss and the effects that missing teeth can have on the appearance of your face. At the Djawdan Center for Implant and Restorative Dentistry in Annapolis, Dr. Kian Djawdan utilizes advanced technology not found in most local dental practices to plan your tooth replacement solution in a real 3D environment. There are a number of dental implant solutions depending on your specific needs. Missing one or two teeth? Dental implants can be used to replace one or two teeth. Usually, the implant is placed and restored with a porcelain dental crown or bridge. Dental implants can be used to replace teeth that are congenitally missing or teeth that have been lost due to accidents, tooth decay, gum disease or other reasons. The tooth implant will help to maintain the bone structure and prevent neighboring teeth from moving or shifting, which can cause additional problems and/or tooth loss. If you are missing several teeth in a row, dental implants can be placed to support a hybrid-bridge or partial denture. Dr. Djawdan offers treatment with the aid of sedation dentistry so that you can have your replacement teeth restored in just a few visits, while you sleep. Our local dental clinic in Annapolis offers a variety of treatment techniques to replace all of your missing teeth using dental implants. We can also secure ill fitting dentures with the use of mini dental implants. Favored solutions include “All on Four” Dental Implants and “Teeth in a Day” which offer immediate function dental implants, so you never have to go a day without your smile. Dental implants are an advanced restorative treatment that requires the services of a skilled professional utilizing state-of-the-art technology. The cost of treatment can vary widely depending on the number of teeth missing, the condition of the bone and gums and the aesthetic goals. While treatment certainly isn’t cheap, we urge patients to consider not just the dollars and cents of the treatment – but the value that dental implants can provide in terms of the improvement to dental health and quality of life. That said, we offer a variety of payment options in order to make this valuable procedure more affordable. We offer complimentary consultations and free patient seminars which give you an opportunity to visit our Annapolis dental office, meet our team and learn about the dental implant treatments that are right for you. During this consultation, we can review dental implant cost and discuss payment options. Despite the proven health benefits of dental implants, they’re often considered to be an elective procedure and generally are not covered by dental insurance. However, there are a variety of options available to help you pay for your dental implant treatment and our friendly staff can help you review your options. We offer a 5% courtesy accounting adjustment for payment by cash or check. We accept Visa, MC, Discover, American Express and Care Credit. Monthly payment plans offered by The Lending Club. Often times, we find that patients are able to secure the best terms and rates through equity loans. That means going through a private lender, such as the bank, and using collateral (car, house, boat, etc) to secure the loan amount. And it’s not just the financial cost of all these treatments. Going without your teeth impacts the way your smile looks, your ability to speak and your overall self-confidence. The impacts of missing teeth can be far-reaching, affecting your overall health, social interactions and even ability to get a job. 3 and 4. Misch, C. (2005). Dental Implant Prosthetics. St. Louis: Elsevier Mosby. What materials are used in a Dental Implant? The most common material used for a dental implant is titanium or a titanium alloy. Ceramic may also be used in patients wishing to have a non-metallic option. What are the benefits of having a Dental Implant placed? There are many benefits to having a dental implant placed. A missing tooth can be replaced without cutting down the adjacent healthy teeth as is required when placing a bridge. Implants allow the dentist to replace missing teeth even when a bridge is not an option. Dental implants can provide a more stable base for a denture, particularly in the lower jaw. Also, dental implants help to preserve and maintain healthy jawbone in the area of the missing tooth or teeth. With proper home care and maintenance, dental implants from our office in Annapolis can restore your smile and chewing ability for a lifetime. What are the risks associated with a Dental Implant? There is always a small chance that the dental implant will fail to integrate with the jawbone and have to be removed. Certain medical conditions can put you at a higher risk for dental implant failure. As with any surgery, there is a potential risk of surgical complications when placing a dental implant. Improperly positioned dental implants can make it difficult–if not impossible–to place a useful dental restoration in the mouth. Implant supported restorations do not have the same feeling as a normal tooth and it is possible to put too much pressure on them when chewing, leading to damage of the implant restoration or opposing tooth. What is the alternative to replacing a missing tooth with a Dental Implant? Bridges, dentures or partial dentures can replace missing teeth without requiring implants. The missing tooth or teeth can also be left without replacement. This, however, can lead to other problems such as an unstable bite or unwanted movement of the surrounding teeth. Our dental office in Annapolis welcomes the opportunity to help patients explore all possible treatment solutions. The Djawdan Center is not a corporate chain with high-pressure salespeople. There is no “one-size-fits-all” solution. We believe in listening to what you want to achieve and then designing a custom treatment solution based on what you to achieve. You may have several treatment options to consider. We understand that most people have to plan and budget for the treatment they want and we welcome the opportunity to be a part of that process. If you have questions, please feel free to call us at 410-618-5966. If it's after office hours you can email us by filling in the Have a Question contact form. If you are ready to schedule your judgment free consultation, please feel free to call or complete the request a consultation form.